We are proud to offer Chest Anti-Wrinkle Pads from Natural Beauty Labs. Reduce and eliminate cleavage wrinkles while you sleep. 100% SATISFACTION GUARANTEED. If they don't help you we give you your money back. Lines on your chest (décolleté) will appear over time – they are triggered by a combination of the natural aging process and prolonged time in the sun. When you sleep on your side the skin between your breasts can become creased, due to gravity. This leads to permanent wrinkles, which makes us look older than we actually are. Once the collagen in skin breaks down from age and sun exposure, those wrinkles tend to linger. Fact is that those generously endowed — whether surgically or naturally— tend to have more chest wrinkles. So what can we do about this? We spend a fortune on make our facial skin look good, but don’t we forget to include our chest area? There are a number of solutions to prevent and reduce chest wrinkles, including creams, chemical peels, injections, micro needling, and laser therapy. Some of these treatments are expensive and the results often questionable. The latest convenient and effective solution is often overlooked: chest pads made of silicone. 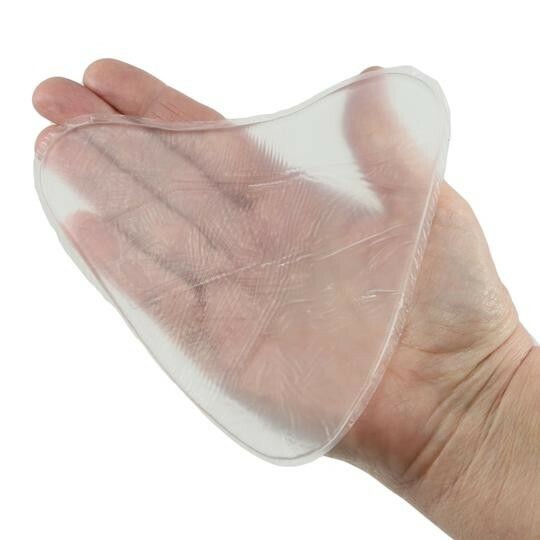 High-quality pads targeting chest wrinkles are made of 100% medical-grade silicone, which is a material tested for biocompatibility and safety. Silicone pads help moisturize the chest area while you rest, on your back or on your side. They help retain your skin’s natural moisture - they lock it in, which promotes the prevention and reduction of lines and wrinkles on your chest. The skin-friendly material makes the application pleasant and ensures wearing comfort and effectiveness. If you use the pads on a regular basis at night or during a nap, you’ll notice that your chest skin starts to lose its wrinkles and will look smoother, more radiant, and rejuvenated. Using silicone pads as an effective anti-wrinkle device instead of expensive remedies such as lotions, serums, or other chemical creams is the latest trend when it comes to removing the visible lines between the breasts. I will sound like I am lying but in two weeks my chest area went from DEEP creased wrinkles to as smoooth as a teenager. I have not worn anything that shows cleavage in 2 years +. Love this product and will never go without it again. Two months in and still on the first one. THANK YOU! I think these are by far the best. I've used several others even the sikcskin one. They are all about the same for the time frame of lasting. This one is a bit longer plus you get two. So I'd say out of all of them this is the best deal and price. I do wash mine with a non moistrizering soap that helps and I heat in the microwave to make it sticky when it starts to lose the stick. So one pad lasts approximately 1.5 months. They stay on all night and no irritation, and I’m seeing results after just a week... nice to wear low cut tops again! they really do work, wrinkles are gone the next morning an with regular use they stay gone! Really works!! I'm a 38DD and hate waking up with chest wrinkles every morning (I'm 50 yrs. old)...Stick this silicone pad on before bed, and no wrinkles in the morning! Each pad lasts 2-4 weeks. Great product!